Welcome to our Best Choice Products vs Touchstone Onyx 50″ Wall Mount Electric Fireplace Review. Spoiler Alert: Both electric fireplaces are similar in size, look and modern design. We really like the styling on both. Which is BEST? For those with a low budget and looking for a bargain – The Best Choice Products electric fireplace fits the bill. It DOES have a near fatal flaw. For QUALITY the Onyx Touchstone 80001 can’t be beat. (that is the fireplace we own.). read on for some bullet points. We also provide links to full reviews. As with all of our reviews, we want you to fully understand all of the features and benefits of both fireplaces. We have published some pros and cons about each fireplace and these are summaries from full comprehensive reviews we have done on each. Once you have read all of this review you will have all of the information you need to decide if it is the right fireplace for you. ✅ Buyer rated 4.6 stars. Clean, contemporary lines with black border. Tempered glass front that does not get hot. The same heating capability -supplemental heat up to 400 square feet. Two speed blower fans for heat – High/Low. Adjustable intensity levels of flame effects. Heater: Average – The heater with this unit has a power rating of 750 watts on low and 1500 watts. Best Choice does not make heating claims but most manufacturers state “supplemental heating for up to 400 square feet”. This heater is average for the class. Flames: Above Average – The flame effects can be operated without the heat and have 5 levels of brightness. Most buyers were pleased with the realistic look. Value: ✅ Excellent – This unit offers a great value. Few electric fireplaces offer this many features at such a LOW PRICE. Quality: ⛔ Poor – Of the 62 reviews posted at the time of this post, 17 commented on damage, not working etc that is a whopping 27% buyers not happy. a poor showing. The star rating is 3.9, with virtually all dis-satisfaction on condition issues. The Best Choice Products fireplace has many of the features found on more expensive fireplaces. In fact, in terms of looks and features this fireplace is hard to distinguish from the more expensive Touchstone Onyx. The electric fireplace maker did a really good job in providing value for the price charged. The let down is in terms of product quality, and the goods being damaged either before or during delivery. Customer satisfaction numbers reveal this. These fireplaces are big and bulky to have to repack and return them is a major hassle. In fact, a lot of buyers just except at the damaged goods for that reason. The question you must answer for yourself is that if most things are equal are you willing to take a chance on a less expensive product with increased risk of damage. If the risk of scratches and dents don’t bother you you will not find a better value in a 50 inch wall mount electric fireplace. Click Here For Our Comprehensive Review of The Best Choice Products Wall Mount Electric Fireplace. Heater: Average – The heater with this unit has a power rating of 750 watts on low and 1500 watts. Touchstone says “supplemental heating for up to 400 square feet”. This heater is average for the class. Flames: ✅ Excellent – The media the flames arise from can be traditional logs or more contemporary white crystals. Both are included. The flame effects can be operated without the heat and have 4 levels of brightness. Most buyers were pleased with the realistic look. Value: Very Good– This unit is a low to mid-priced electric fireplace. Quality: ✅ Excellent – The average star rating is 4.6, which indicates high perceived quality and satisfaction. Virtually all negative comments were about heating capacity, (unrealistic or uninformed buyers). This fireplace is available in two finishes – Black or Ivory . Though the images black the black appear bigger – they are the same fireplace in a different finish. 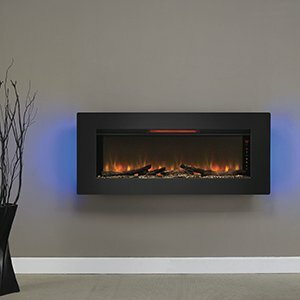 We have reviewed close to 50 electric fireplaces. It is only fair to tell you – we own the Onyx 80001 electric fireplace, and love it. For us, it provides the perfect blend of features, quality, reliability at an attractive price point. We actually bought this during Amazon “prime days” which saved us 20% making it a no-brainer. It is perfect in the bedroom above the dresser. The flame effects, heating capacity, remote control, are all very good or better. This fireplace is the perfect blend of features, benefits, and most importantly, quality at a very fair price. ✅ This is a definite ‘BUY’ recommendation. We did. Click Here For Our Comprehensive Review of The Touchstone Onyx Wall Mount Electric Fireplace.